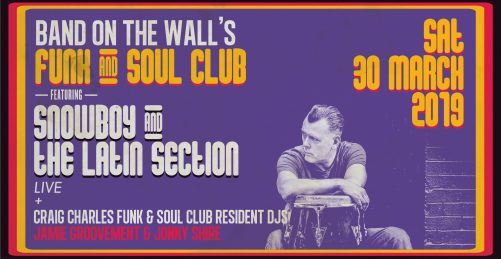 Band on the Wall’s Funk & Soul Club returns with Snowboy and the Latin Section live, alongside Craig Charles Funk & Soul Club Resident DJs Jamie Groovement and Jonny Shire. Snowboy has recorded or performed percussion with many, many Jazz and Latin artists such as Airto Moreira, Deodato, Makoto Kuriya, Herman Olivera, Flaco Jimenez, Jon Lucien, James Taylor Quartet, Big John Patton, and Incognito as well as Lisa Stansfield, Imelda May, Amy Winehouse, Rod Temperton, Mark Ronson, Basia, Simply Red, Mick Hucknall, Mica Paris, Darrel Higham, Patti Austin and many, many more. More importantly he is also the leader of his world – famous Afro-Cuban Jazz group, featuring a who’s-who of the UK’s most exciting and fiery Jazz and Latin players.